We all know about avoiding prohibited foods, but may not know why, or what effects they produce. Becoming aware of such bad effects will cause us to think extra before eating more “delicious” sin. We understand that there are difficulties faced by certain householders, especially if both husband and wife work, or are being surrounded by indifferent family members. Whatever the situation, it is worth trying to place oneself in an advantageous eating situation with what “little time” we have. We usually hear arguments like, “I am eating or buying from a “mode of goodness” outlet.” Such places are deemed “spiritual,” “trustworthy,” or “favourable.” With further analysis on this, we could be in for a rude awakening. These “beneficial” outlets can be more dangerous than we ever thought. In the 3rd chapter of Bhagavad-Gita As It Is we should have learned that when people in general eat foods not first offered to the demigods or Krishna, it is an act of theft. One eats only sin. The paying to purify argument has little validity here, because first of all, one will be buying food items not intended for Krishna’s pleasure. One will purchase only stolen goods. Considering that one may be very hungry, and hoping for the Lord’s understanding, will Krishna still accept one’s offering of Bhakti in offering stolen goods? Then we have to see how essential this offering was. Was there ever a little time to prepare and make something beforehand the proper way, before having to buy sinful food? All these ifs and buts weigh up in our overall mood of offering sinful foods. Since sin means to oppose the will and desires of the Lord, we can only imagine to what extent the sellers of sinful foodstuffs are infested with all of its corollaries. However delicious or wholesome their foods are, they are still infected with, “Wow” jiva-aparadhas, “Far out” nama-aparadhas, “Delightful” lust, “You gotta try this” anger, and “Sublime” greed. We may have our friendly contacts, and concerned, loving family members that have our best interests at heart. Relying on them for our meals we think nothing of any ill-intent towards us. If invited for a “vegetarian dinner,” we’ll go and visit. After all, we hate to offend our hosts by declining their welcome. We’ll also buy the usual “pure vegetarian” take-aways from sattvic outlets. The effects of eating food cooked or prepared by well-meaning people could be more subtle and dangerous than eating grossly sinful foods. Many of these “mode of goodness” people harbour insidious, impersonalist or mayavadi concepts. During their own preparations they will probably offer the food to some human being they consider as the source of all avataras – svayam-bhagavan, or they will impose their nihilistic or “God has no senses” thoughts, all for our benefit, of course. 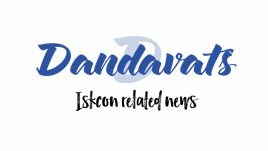 These people are sometimes affiliated with a parampara that goes back perhaps one or two hundred years, founded by someone who has since assumed God status. Though very popular, their offerings certainly pollute the consciousness of aspiring Bhaktas. Their “all paths lead to one” sentiments are ingrained with Nama-aparadhas. Belonging to a New-age group can express fanciful blends of home-made faiths. By accepting or buying foods from such people based on intimate trust, is discouraged: “…for by such intimate intermingling we may become affected by their atheistic mentality…” (NOI text 4 purport) And since such people are generally indifferent, and see Bhakti as just another pious deed, they are also guilty of another offence to the holy name. The word insidious is used because we cannot always tell what “hit” or affects us when we are trying to chant japa, or to concentrate while reading and hearing. Sometimes our power of recollecting essential scriptural information when preaching or memorising, is compromised. But we can categorise the effects as gross and subtle. Those who are not accustomed to eating “karmi” food will notice some immediate effects. One will notice the bland and emptiness of the contents; nothing compares with Sri Krishna prasadam made with love and devotion. On eating such food, a feeling of nausea can arise, and a general “yucky!” feeling. Common reports of bad dreams, and other certain symptoms practitioners are embarrassed to reveal, are the lusty desires that come unsought. These symptoms should remain distinct from cases where, living in a temple and subsisting on prasadam alone, one entertains lusty desires by wilful desire. “Sri Chaitanya has also warned…”By eating food prepared by worldly people, one’s mind becomes wicked.” (NOI text 4 purport) When the mind is infested with dirtiness, this will likely slow our devotional tempo: “At the present moment people are manda, very slow. They do not take this Krishna consciousness movement very seriously…” (Teachings Of Lord Kapila, Ch. 10) Srila Prabhupada writes this in context of the word “bhoga,” which means, sense gratification. 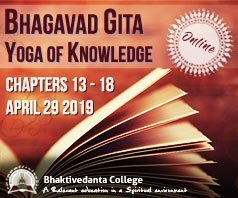 Referring to the Bhagavad-Gita verse 2.44, we read this: “Those who are overly attached to opulence and sense gratification cannot understand spiritual life; they are very slow to take to it.” (TLK Ch. 10) Perhaps if we are taking Krishna consciousness casually, despite the onset of old-age, our intake of bhoga is the cause. This has the ability to downgrade the importance, or urgency of spreading Krishna consciousness. In fact, bhoga can bewilder us. This casual attitude can be compared to being concealed with the smoke of partial Krishna consciousness. (BG 3.38) But, “Bhakti is never casual.” Srila Prabhupada states: “It is direct activity in service to the Absolute Truth.” (BG 9.26 purport) Here is further evidence: “One who eats sin…cannot execute perfect yoga.” (BG 6.16 purport) We all know that yoga is Bhakti-yoga. Whereas a devotee will feel certain immediate effects of consuming bhoga, a casual attitude will less likely feel or experience many symptoms, because persistent eating of wicked food does not help to distinguish very clearly. Eating prohibited food clouds our thinking and dulls the brain. It is not just hot milk that helps build finer brain tissue for understanding transcendental subject matter. Feeling infected one may seek some solutions, like attending a japa workshop. If the fire of the experience dampens the taste for “karmi” food then it is worthwhile. If one returns to eating the old favourites then it is like dousing the fizzling flames with the ice-cream of dark-night withdrawal. It might sound harsh, but our implication in this theft, or loving aparadhas, will always check our real devotional happiness and progress. (5)Dampens the enthusiasm for devotional service. (8)Creates impersonal or mayavadi thoughts. (9)Causes one to commit vaisnava aparadha. (10)Causes one to commit Nama-aparadha. (12)Causes one to be inattentive while chanting. (16)Makes one less serious in devotion. (18)Makes one casual in the matter of devotion. With a list as long as this we can see how the dangers of eating the wrong foods cannot be underestimated. Your servant, Kesava Krsna Dasa – GRS. I remember that whenI joined “grains cooked by karmis” were condemned. Now I see many devotees eating store bought bread. Most will check that there are no eggs. Some seem to think that if they toast the bread then it is prepared by devotees. As a reply to store bought bread, many commercially baked breads contain “mono and diglycerides. Check the label. While these can be plant based, they are more likely animal based because it’s cheaper. You run the risk of unknowingly eating non-veg when you buy processed foods. So many animal ingredients are hidden under cryptic names. Best to stay away from all processed foods for this reason. I agree and do not dispute any of the facts brought out in this article. I am very cautious and rarely eat out, and will not eat in any restaurant that serves meat. I do have one problem though. I came to Krishna Consciousness in my adult life and I find a lot of the Indian foods unpalatable for my overly conditioned taste buds. Additionally, I am allergic to coriander/cilantro which everyone insists on putting in EVERY dish. The argument is made, “Krishna likes this type of food.” Also, temple prasadam is quite often unhealthy, and filled with very rich, fried and oily preparations. There has been a movement away from unhealthy preps, but it does still continue, especially in India where I live. So I cook at home mostly, but it’s more “comfort” American and/or Italian food. I am hoping that this is acceptable to the Lord. I know we’re supposed to be pleasing Krishna, but what’s a person to do? After all, Krishna is not only Indian, He is universal, right? Allen Ginsberg: Is the Chaitanya-Krishna ritual, as you have it here in this house and in the other ashramas, is that something that a large mass of people can enter into? Prabhupada: Yes. Because we have seen. All my students are Americans. So it has to be… And it is spreading. 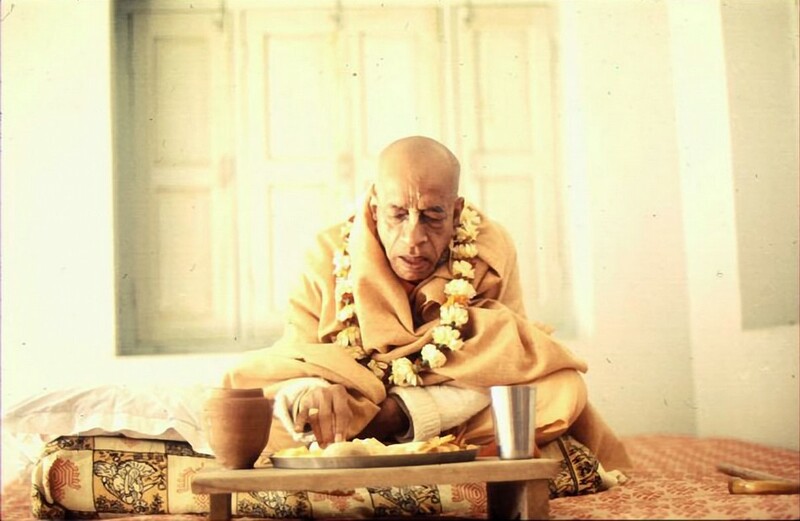 Prabhupada: That is not very important. Allen Ginsberg: And an adaptation to Indian food. Prabhupada: No, no. Indian food… It is not Indian food. Are you not eating fruits? Prabhupada: Then that is Indian food? Do you mean to say it is Indian food? Allen Ginsberg: Well, the curries. Prabhupada: Curries you may boil only. That doesn’t matter. It doesn’t matter that you have to take our taste. No. That is not the program, that to become Krishna conscious you have to change your taste. No. We say from the Bhagavad-gita… Krishna says, patram pushpam phalam toyam yo me bhaktya prayacchati [Bhagavad-gita 9.26]. “Anyone who is offering Me with devotion these vegetables, fruits, flowers, milk, I accept that.” But we are going to satisfy Krishna. Therefore we are selecting foodstuff from this group. That you are all already accepting. Don’t you take vegetables? Don’t you take fruits? Don’t you take grains? So where is the new item? Now, so far cooking, you can cook in your own taste. But the group must be this. Not meat. Because Krishna does not say. That is our program. So you are already taking grains, you are eating fruits, you are drinking milk. So where is the difference? I don’t find any difference. Allen Ginsberg: Well, I suppose not. You could say there is no difference because the food is basically the same materially. It’s just a question of the style. Prabhupada: Yes. Now you take… Style may be different. That’s all right. Besides that, to maintain your body and soul together, you require eating, you require sleeping, you require mating, you require defense. We don’t say that you don’t do this. Krishna was… Arjuna was defending. Rather, he wanted to be nonviolent. “Oh, what is the use of fighting?” Krishna said, “No. It is required. You should.” So where is the difference? There is no difference. Simply we are adjusting things so that you may become happy. Any intelligent man will take it. We are not prohibiting, but we are adjusting. So there is no difficulty. Simply intelligent persons like you should try to understand and take it and administer because your country is wanting this. Thank you for this article, prabhu. I’ve seen my standards slip over the years, from – for example – not eating any chocolate for 10 years, to eating chocolate and “kind of” ‘offering’ it with a barely-conscious lightening-quick “Hare Krishna” mumbled in the mind as the wrapper is being ripped off with close to zero thought or meditation on seva to the Lord. So your article reminded me that there are clues as to why I have little bhakti – I can think about what I’m putting in my mouth. Which is a reminder to put some serious thought into improving and making changes.